Moundville was a site occupied by Mississippian culture from about 1000 A.D. until 1450 A.D., in central Alabama. One of the largest settlements at the time, the site boasts what appears to have been a highly stratified society. The town was occupied for some time, but the fall of the community was rapid. Scholars have said that most of the culture is still not entirely understood. 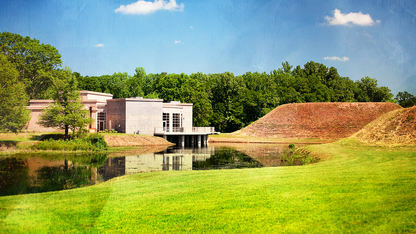 The Moundville Archaeological Park now rests on the site. The park itself is 320 acres and contains at least 26 prehistoric, Mississippian culture-era Native American earthwork mounds, burial sites, plus numerous artifacts. A museum was erected in 1939, and it now combines some of the latest technology and over 200 artifacts to showcase one of the most significant Native American archaeological sites in the United States. Some archaeologists believe that Moundville is a link to ancestral Chickasaw history. Moundville pottery that dates from 1100 to nearly 1500 has been found west of the Tombigbee River in Mississippi. This indicates that people from Moundville could be ancestral Chickasaws.